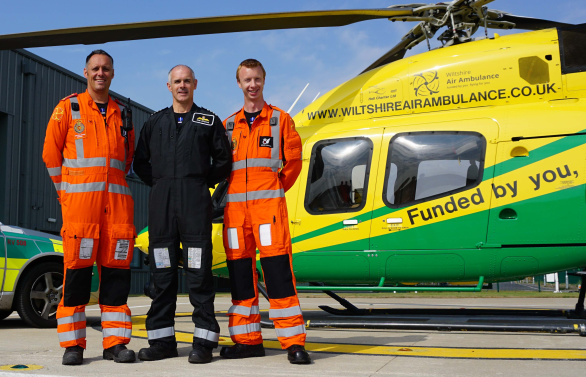 WILTSHIRE Air Ambulance has revealed how often it was called out to different parts of the county in 2018 as its total missions rose by 26%. The demand for the skills of the charity’s critical care team resulted in increased numbers of call outs to the Swindon, Melksham, Chippenham, Trowbridge, Warminster, Calne, Westbury, Malmesbury, Bradford-on-Avon and Corsham areas. The largest number of incidents that Wiltshire Air Ambulance responded to were in the Swindon area – 182 – equivalent to a call out, on average, every two days. Locations where Wiltshire Air Ambulance was called to once a week, on average, were the Melksham area 82, the Chippenham area 79, the Devizes area 75, the Salisbury area 68 and the Trowbridge area 63. Other areas in Wiltshire where the team were called to were Warminster 37, Calne, 34, Marlborough 28, Westbury 25, Malmesbury 21, Bradford-on-Avon 15, Pewsey 14, Corsham 14, Royal Wootton Bassett 11, Tidworth 9, Tisbury 6, Cricklade 3, Mere 2 and Highworth 1. The largest number of call outs were to cardiac emergencies, 248 – almost one in four of the total incidents – while 220 – one in five incidents – were to road traffic collisions and one in ten incidents – 109 – involved children. In addition the team were called to 62 sporting accidents with almost half, 28, involving horse riders.